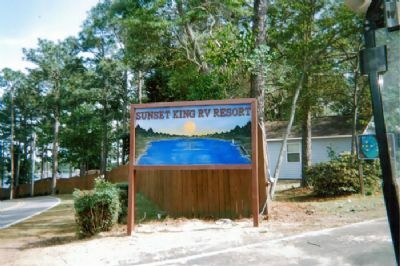 Great fishing and lounging in the sun await you at the Sunset King Lake RV Resort, in the Florida panhandle along the shores of King Lake. 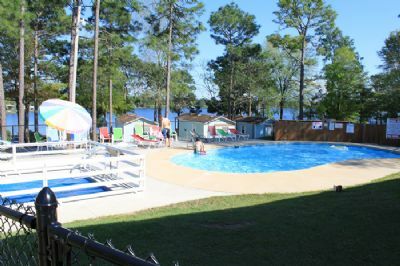 The resort features 100 campsites with plenty of space even for the "big rigs" - complete with full hookups, Wi-Fi, and cable TV. The heart of any stay at the Sunset King Lake RV Resort lies in the fishing. The big lake holds a wealth of opportunities for any angler looking to catch bluegill, crappies, catfish and largemouth bass. If trophy-sized bass and large bream are not enough, the Gulf of Mexico, with its myriad of opportunities for deep sea fishing charters, is only an hour's drive away. The resort is 40 miles north of Destin, a popular beachfront town with sparkling white sands and famous water parks. These Florida campground memberships for sale are a great way to have fun in a big-rig friendly RV resort. Unlike some campgrounds, Sunset King Lake is set off from the highways, making it a much better stay where you can enjoy acres of peace and quiet. Throughout the year, the campground hosts different events, potlucks, and holiday parties, making this an ideal destination to return to for revisiting old friends year after year. Other activities are a constant, including the mini golf course, roasting s'mores over a bonfire, and swimming at the pool. Groceries and other essentials can be purchased at the onsite general store. In addition to the lake and onsite activities, the area has a lot to offer. Ponce De Leon State Park's 68 degree hot spring is its star attraction, along with two trails showcasing Florida's natural ecology. With these Florida campground memberships for sale, you can also sample some of the region's finest vintages at the Chataugua Winery, which hosts both tours and wine tastings. At the Sunset King Lake RV Resort you can idle away your days with fishing and relaxing by the lake, or travel about and see more of the panhandle. Either way, you will always have a spacious RV campsite to come home to at the end of the day. Contact Sunset King Lake RV Resort Specialist Today!